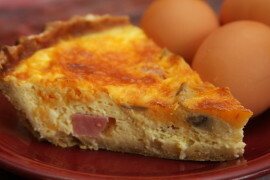 Quiche is an extremely easy to make meal that can feed up to 8 people. This quiche recipe is delicious, nutritious, and tastes great when warm out of the oven. Nothing tastes better than a wholesome, home-made quiche! Preheat the oven to 350oF and grease two pie dishes. Mix the butter and flour together till crumbly. Add in the sugar, salt and milk. Gently mix till the dough comes together. Do not over mix. Separate the dough into two and roll them out to fit the pie dishes. Dock the bottom of the crust with a fork to prevent bubbling of the crust. Mix together the eggs, ham, cheese and milk. Pour them into the baked pie shells. Sprinkle with more cheese if needed. Bake for 1 hr or until inserted knife comes out clean.